If you take your Toyota Tacoma off-road, there’s a good chance you’ve been stuck at least once in the past. Fortunately for you, you had something (a winch, a tow strap and a buddy, MaxTraxx, etc.) that got you un-stuck. 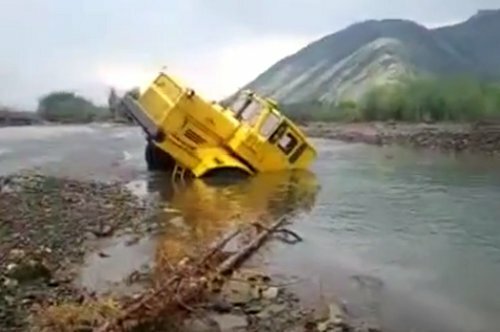 But what if you’ve got a big diesel tractor-trailer rig trying to cross a mountain stream with an extremely soft bank? Is this tractor trailer stuck, or can it get un-stuck with a little effort? Read more to find out. Looks like a formula for disaster, doesn’t it? BUT IT ISN’T!! 1st gen Tacoma through the river was pretty awesome. What was the first rig? Jon – I can’t say. Russian I think…I’ll see what I can figure out.